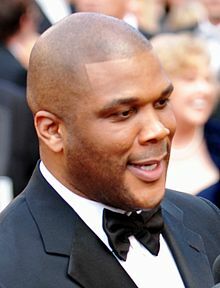 Tyler Perry (born Emmitt Perry, Jr. on September 13, 1969) is an American actor, director, screenwriter, playwright, producer, author and songwriter, specializing in the Gospel genre. Perry is best known for both creating and performing in drag the Madea character, a giant, overreactive, and thuggishly tough elderly woman. Those audiences are my critics. They tell me right away! I learnt very early on how far I can go, what I can and can’t say on stage. They inspire the stories that I tell, and how I tell them. It has to be something that the core can relate to. And what I’m finding is that if you serve the core, it grows, and you find a whole new audience. I didn’t want to be the kind of man that my father was. So I’ve tried, my entire life, to be the complete and utter opposite of that. And it has served not only the art well, but I think the audience well. Children love their mothers. Especially with a boy child and his mother, there's a bond that's unbreakable. I love my mother to this day. One of the most painful things I ever had to do was bury her, realizing that even though I was her hero, I couldn't help her with this last thing. I couldn't help her get better. All I wanted was to give her everything she wanted. Everything my father didn't give her, everything she never had. What I know beyond a shadow of a doubt is that God is with me. I know that. I know that He's always been with me. It is evident in everything I have endured—and the fact that I made it through with some sanity. This page was last edited on 4 August 2018, at 17:58.